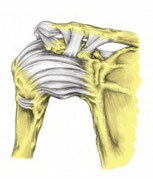 Use the tabs below to view the most common types of shoulder Injury. 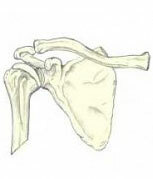 A traumatic injury where the head of the humerus is forced out of the socket at the shoulder. 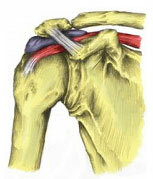 A tear of one or more of the four rotator cuff muscles or tendons which surround the shoulder joint. 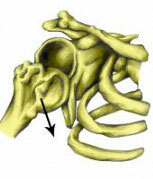 Injury to the ligaments which hold the acromioclavicular joint together at the top of the shoulder. Inflammation and swelling of the bursa (sack of fluid) which sits under the AC joint in the shoulder. This has similar symptoms to inflammation of the supraspinatus tendon. 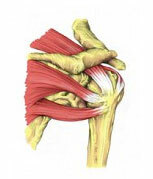 Pinching of one or more tendons within the shoulder joint, especially on overhead movements. 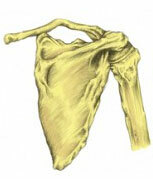 The supraspinatus rotator cuff tendon becomes impinged or trapped between the bones. 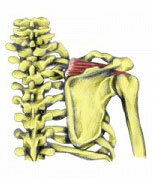 Shoulder pain and stiffness in the shoulder which slowly gets worse until the shoulder can barely be moved. A frozen shoulder will go through three phases before it is finally cured. 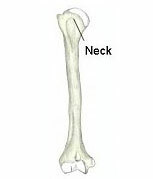 A break in the upper arm bone, near the top, just under the shoulder joint. A break in the collar bone (or clavicle) usually caused by a fall onto an outstretched hand. 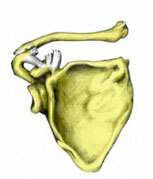 A break in the flat shoulder blade which sits on the back of the ribcage. Usually due to a direct impact. This overview of shoulder injuries is intended to provide general information only and are not a substitute for medical advice about your particular condition.